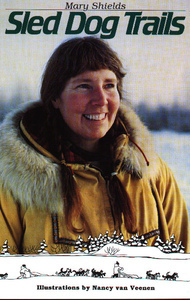 Mary has written five books, and she was the subject of a PBS feature video, Season of the Sled Dog, which shares Mary’s Alaskan lifestyle, celebrating the huskies in their everyday life, on the long race, and on a spring trip. 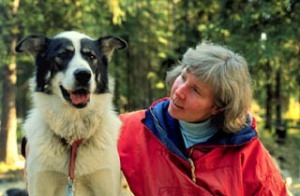 Besides Sled Dog Trails, Mary’s books include Small Wonders: Year-Round Alaska, which is Mary’s journal sharing nature’s cycles and the quiet life in a cabin in the Alaskan woods (featured on Will Curtis’ “The Nature of Things” on NPR), and her books for younger readers include What’s a Shrew to You?, a rhyming picture book illustrated by Jon Van Zyle, and the international award winner, The Alaskan Happy Dog Trilogy. All of Mary Shields’ books, and her video, can be ordered directly from her at Pyrola Publishing. 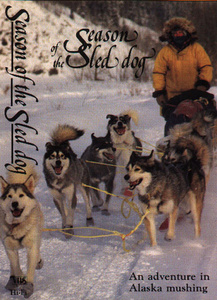 This entry was posted in Alaska History, Books, DVD & Video and tagged Alaskan Tails of the Trail, Hope Race, Iditarod, Jon Van Zyle, Mary Shields, Pyrola Publishing, Robert Service, Season of the Sled Dog, Sled Dog Tales, The Alaskan Happy Dog Trilogy, The Nature of Things, Will Curtis, Yukon Quest. Bookmark the permalink.